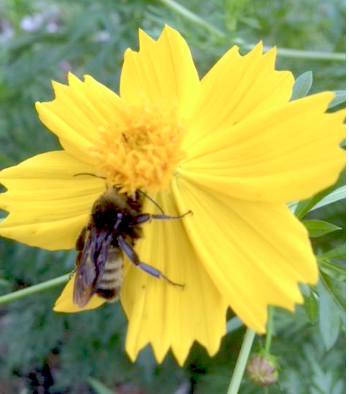 Get a Jump Start on the Pollinator Bio Blitz! COME TO THE GARLAND COMMUNITY GARDEN! Come to the Garland Community Garden this Saturday 9:30 to 11:30 AM. The garden is located at 4055 Naaman School Road Garland 75040. The pollinator bio blitz is an event hosted by the Texas Parks and Wildlife Department. It begins on Saturday October 7th and lasts through October 16th. This nine-day event provides participants all over Texas with the opportunity to view pollinators in action and share their observations with thousands of other Texans. During the pollinator bio blitz, participants of all ages will be encouraged to find pollinators and nectar-producing plants. (Our Garland Community Garden is filled with them.) They will be encouraged to share their findings on Instagram or iNaturalist. iNaturalist is the best place in my opinion to post your photos and findings. Visit iNaturalist. and you’ll see how it’s set up. Go to (http://tpwd.texas.gov/education/bioblitz/registration) to register for receiving daily emails Oct 7 -16 with tips from the Texas Parkas and Wildlife Department on how to take great photos and more! So what’s happening at the Garland Pollinator Bio Blitz Jump Start Saturday Oct 1st? FREE WILDFLOWER SEEDS: Loving Garland Green will be handing out packets of wildflower seeds. The ideal time for planting these seeds is right around our first frost. Wildflower seeds do better if planted in the fall. However planting them too early in the fall might cause them to germinate. This would not be good since they would not have time to flower and make more seeds prior to the first frost. 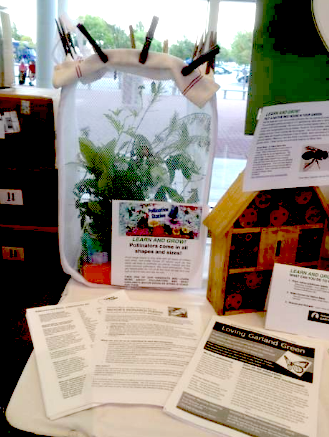 FREE INFORMATION: We will be handing out information regarding how you can participate in the pollinator bio blitz. LEARNING: You will have the opportunity to view and learn about a large hugelkultur we are completing near the end of October. November 1st we will seed it with wildflowers and other native plants. We will also hand out information on hugelkulturs for those who are interested in building their own. SEEING: You will be able to see what a great place the Garland Community Garden is for pollinators so you’ll know where to go to take some great photos for the Bio Blitz starting on October 7. 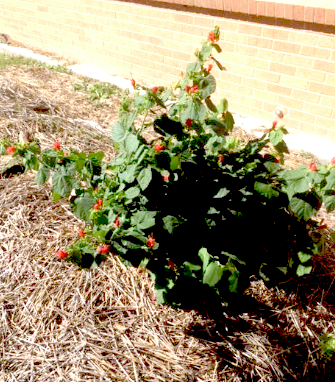 Large healthy Turks Cap growing in the hugelkultur at Watson Tech Center in Garland—testimony to the water efficiency of a hugelkultur and using native plants. This plant more than quadrupled its original size (planted in May) over the summer with no water other than rainfall. Today Charlie and I made a run to Watson to deliver the trellised pot of green beans we used for a demo at the Live Well Go Green event last weekend. We had not been back to Watson since last May when we spent a grueling day (6 hours) building a hugelkultur assisted by parents, students and Jennifer Clements, one of the second grade teachers at Watson Tech. It was near the end of the school year with only a couple of weeks left. Still we wanted to plant something in the hugelkultur just to see what would happen over the summer when it was deserted for three months. I don’t think the Turks Cap got much, if any, attention over the summer. We were shocked to see that not only had it survived, it had quadrupled in size. It will be interesting to see how other plants grow in this bed. 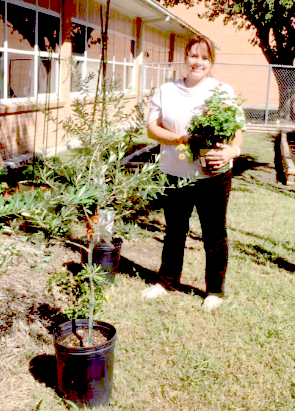 In addition to the pot of green beans we also delivered two olive trees, two lantana bushes, a pot with kale growing in it, and a second pot destined for bean planting by Jennifer’s students. This pot was complete with the soil and trellis. The two bean pots and the kale pot are for demonstrations to the students that you don’t need a “back forty” to grow some of the food you eat. A lot of good food can be grown in containers on a deck or patio. NOTE: Olive trees are generally not recommended for North Texas. However if you keep them in pots and can protect them sufficiently when the weather is below 20 degrees F, then you can have olive trees. Once the trunks are about an inch in diameter they are more cold hardy but still would likely not survive an ice storm. Since Watson Tech has a schoolyard garden and a greenhouse we thought it would be nice to let the students see if they can produce olives. At the least it would be educational for them to see olive trees and learn about them. Live Well - Go Green was a Great Success! 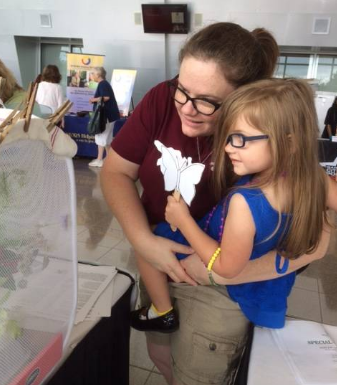 Mother and Daughter look at the Loving Garland Green Pollinator Rescue Basket. The girl is holding one of our freebies: Pollinators on a stick. As exhibitors and visitors to the many booths, the event was a wonderful experience for Loving Garland Green members. We encourage all people who have just about any type of business that is related to healthy living to sign up as an exhibitor next year. You will get a lot of exposure in a short amount of time. Loving Garland Green had 21 people sign our register who are interested in membership in our organization. First of all we had a great location. Our table was just to the left of the entrance door. We did not keep track of the number of visitors who stopped at our booth. However, I would estimate that we had at least 400 visitors. It is a toss-up as to which of our two primary features to support our theme of “Learn and Grow with Loving Garland Green” was the most popular: Our pollinator exhibit that occupied about two-thirds of our table—or the “grow your own” portion, which represented about one-third of our table and part of the floor. FEATURE ONE: PROTECT OUR POLLINATORS! Pollinators come in all shapes and sizes and there are critically linked to the survival of our own species since pollinators are responsible for one of every three bites of food that we eat. 1) A Butterfly Rescue Container made from a mesh laundry basket. One of our members, Nancy Seaberg brought a sample for demonstration. She had several types of butterflies in various stages of their life cycle in this container. Rescuing and releasing butterflies is critical to building back their dangerously low numbers. For example, it is estimated that 95% of Monarchs captured as eggs or caterpillars will survive to be released whereas in the wild it has been estimated that as few as 6% will complete their lifecycle. In addition to Nancy, Loving Garland Green has several citizen scientists who rescue and release butterflies. Last year, as an organization we released over 30 butterflies—from Gulf Fritillaries to Monarchs. We also delivered seven rescue baskets to local school for our local school children to learn and grow in their knowledge of their relationship to nature. 2) Various handouts on the topics of why pollinators are important and how our Mayor, Douglas Athas, supports pollinators by having taken the Mayor’s Monarch Pledge. 3) Native Bee House. Native bees play a huge role in making sure that flowers turn into food for people. In fact, our native bees play a much larger role than our imported European Honey Bee. In Texas we have hundreds of native bees—many of which have never been scientifically studied. Because of urban sprawl, the habit of our nesting native bees is being destroyed at an alarming rate. Unlike the highly socialized European honeybee, our native bees (except for the bumblebee) are solitary creatures. The female builds nests in the ground and plants eggs in hollow tubes such as reeds. Yet our native bees are overwhelmingly responsible for pollinating an estimated $3 billion of our agricultural crops. Unlike the honeybee, our native bees will do their work in all kinds of weather—rain, heat, wind, etc. whereas the honeybee tends to stay in the hive in inclement weather. 4) Pollinators on a Stick. We gave out to the children a cardboard pollinator glued to a wooden tongue depressor. They were designed for coloring: a plain butterfly for designing their own; a butterfly with markings of a Monarch outlined for coloring realistically; a blue tailed Swallowtail; and a Bumblebee. FEATURE TWO: GROW YOUR OWN FOOD! 1) Stretch your grocery budget by re-growing the produce you purchase at the Grocery Store. This element was supported with video showing visitors the steps of how to regrow lettuce and other vegetables such as celery, carrots and Bok Choy. 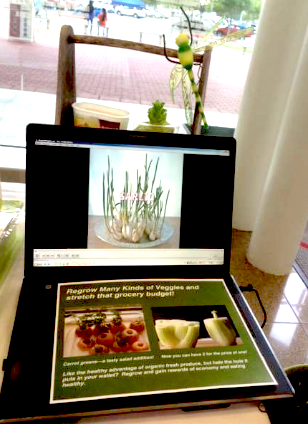 One of our board members, Gene Rodgers, set up this video for us and founding member, Margie Rodgers prepared lettuce as a live demonstration for the display. One slice of a head of Romaine lettuce cut yesterday and in another dish a slice from Romaine lettuce that was cut five days ago and was already about four inches tall with new growth. Visitors were amazed and many reported they were going home and try this experiment themselves. Pulses are dried beans. This food source makes up the protein for the diet of ¾ of all the people on the planet. To help raise awareness for the importance of this food source, Loving Garland Green is participating with students at Watson Tech in helping them to plant some beans this fall. The beans will begin in pots in the schoolyard garden. Then, when the danger of the first frost is imminent the beans will be moved inside to their greenhouse. If all goes well the students should be able to harvest their beans just before the holidays in December. We gave away about 200 packets of bean seeds. They were all gone about two hours before the show ended. The packets contained organic green bean seeds and also striped butter bean seeds. It was as much fun to be an exhibitor as it was to be a visitor. I took a few minutes off to tour a few of the exhibitions on the floors below and above us. There is so much available to us to keep us healthy and to increase our health that it is amazing. On the lower level I saw many of my friends as well at the Keep Garland Beautiful table; Ken Risser with his beautiful rain barrels; Naaman Forest High School with some great demonstrations from their horticultural department; Texas A&M Extension Department; Roaches Feed and Seed; and Dependable Health Care, a Garland locally owned home health care service. On our floor at ground level we had some of Garland’s finest from our police department featured with some of our established civic organization such as the Rotary Club and the Lions Club. One of the most interesting tables on this floor was the “Donate Life” table. At this table visitors could chat with a man who had received a heart transplant. At this table you could learn all about how to sign up to donate life to others through the donation of your organs, eyes and tissue. Then on the upper level you could find all types of screening services such as blood sugar levels; blood pressure; and more. In addition there were various types of vaccinations available. We are excited about the annual Garland "Live Well--Go Green" health expo that will be held tomorrow on Saturday at the Curtis Culwell Center in Garland from 9AM to 1PM. This afternoon we set up our table which is near the front entrance of the Curtis Culwell center. Our table features many interesting items that all reflect our various urban agricultural activities in our local community. Mesh cage with pupas and caterpillars of several types of butterflies. An invitation to join Loving Garland Green at the downtown Garland Library on Monday evening September 26 for a Master Gardener Presentation: "Fall is the Best Time to Garden"
A pot with organic green pole beans growing in it. We are helping the United Nations to celebrate 2016--The Year of Pulses. Pulses are legumes that are dried beans and peas. Pulses are a major source of protein for the majority of people on our planet. After this event Loving Garland Green is donating the bean pot to Watson Tech Center here in Garland. In addition to our informational handouts, our "Freebies" we are offering include Pollinators on a Stick and Magic Beans to plant. Two Important Events Are Coming Up Soon! This once-a-year event makes it easy for folks to choose their favorite charity and donate. Simply go online between 6AM and Midnight and donate to your favorite charities. 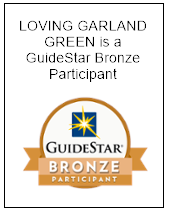 Loving Garland Green members hope that you will give some of your donations to their organization. If you would like to see some of their projects and programs continue and even be expanded, your donation can help make that possible. Go to Loving Garland Green to donate. 2. LIVE WELL -- GO GREEN! Loving Garland Green will have a display table at this annual community event for healthy living. 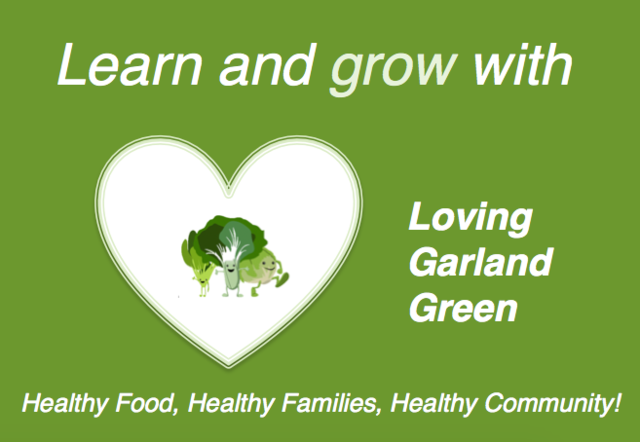 The theme for our table this year is "Learn and grow with Loving Garland Green." Our learn and grow demonstrations include a video of how to regrow the lettuce you purchase at the grocery store that is reinforced with a real-life example. 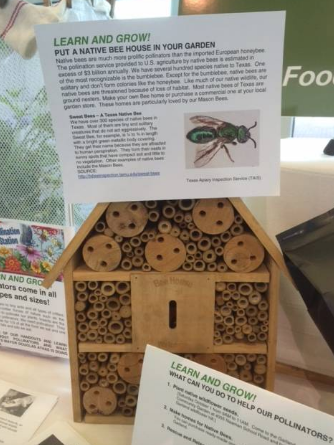 Other real life examples include caterpillars and pupas of several different types of pollinators; a container garden; native bee houses and more. We hope to see you there. This great local annual event features many exhibitors with great information and freebies to make it easy for you and your family to become healthier. Loving Garland Green's theme for this important community event is "Learn and Grow"
The City of Garland is hosting its great annual healthy living expo on Saturday September 24 from 9AM to 1PM at the Culwell Center in Garland. This year it's called "Live Well--Go Green." Loving Garland Green, along with many vendors and other nonprofit organizations, will be participating in this free to the public event. It's a great place to come and get the latest information regarding how you can live healthier. There are lots of freebies as well as demonstrations of the latest equipment for growing healthy food, cooking healthy food, water conservation, etc. A Loving Garland Green brainstorming team will be meeting at my home this Saturday to plan the contents of our table at this event. The ideas I'm bringing to this meeting include the suggestion to center our information around three main topics: 1) 2016 International Year of the Pulses 2) Ways that we are supporting Mayor Athas and his pledge to support Monarchs and other pollinators and 3) Emphasizing our involvement and community outreach to our local Garland School students with our hands-on assistance in schoolyard gardens and through our stewardship of the Garland Community Garden. 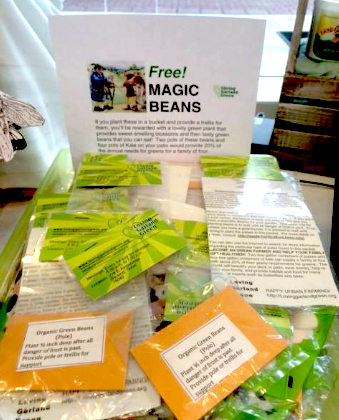 In addition to information sheets about our organization, I am suggesting that we package bean seed packets as our give away; have two versions of a pole bean container; have a basket containing a monarch pupa; have some loofah bath sponges for display along with a green one and photos of the loofah tunnel down at the Garland Community Garden. Pulses are food legumes, with edible seeds. Beans and peas comprise the largest portion of this food group. Pulses belong to the scientific family Fabaceae. Almost three-quarters of the world’s population derive most of their protein requirements from pulses. Therefore, the United Nations has declared 2016 as the “International Year of Pulses” to create greater awareness to produce and consume more this healthy and sustainable food choice. You can also use the Internet to search for more information regarding the particular type of pulse found in this packet. BECOME AN URBAN FARMER AND HELP YOUR FAMILY GET HEALTHIER! Two five-gallon containers of pulses and four five gallon containers of kale can supply a family of four with about 20% of their yearly requirements for greens. The plants will beautify your deck or patio, save money, help to feed your family, and provide habitat and food for many beneficial insects such as butterflies and bees. Loving Garland Green is donating this pot (complete with four poles, soil and pole green beans planted) to the students at Watson Tech. It can be kept outside in the schoolyard garden at Watson until the first frost is imminent. Then it can be brought in to the greenhouse. It should begin producing beans in mid-December. We may also assist some of the teachers at Watson in creating a few more of these patio planters for their garden and greenhouse. For these additional planters we will use recycled parts such as five-gallon garden buckets and old bamboo stakes tied together teepee style. PLEASE HELP PROMOTE THIS EVENT AND MAKE IT THE SUCCESS IT DESERVES TO BE BY POSTING THIS ON YOUR FACEBOOK. 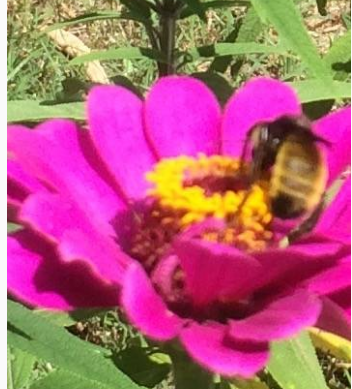 Native Bumblebee on Zinnia at Garland Community Garden - 9/9/2016 - We have homes for native bees scattered throughout the garden. Several experiments have been undertaken at the Garland Community Garden in 2016. I use the word “experiment” loosely. I do not mean a highly controlled and measured scientific experiment with an experimental and a control group along with detailed note taking. I mean a loosely controlled layman’s observation more along the lines of: “Let’s try this and see what happens.” This is a mindset that we like to encourage for all Garland gardeners as great new innovations sometimes arise by accident and from casual observations. Of course, as the mainstay for the core of our gardening activities we stick to the tried and true methods based on scientific knowledge provided us by groups we respect such as Texas AgriLife and other gardening experts in our area. Intercropping is a technique that is especially applicable to the urban gardener as it maximizes limited space. It is a multiple cropping process that involves growing two or more crops in close proximity thus enabling a greater yield on a piece of land than would have been obtained with a single crop. Of course it is important to not have plants that will be competing for the same resources. Thus shallow rooted plants are placed with deep-rooted plants; tall crops with shorter crops requiring partial shade; etc. Biodiversity is achieved which in turn provides a variety of insects and soil organisms. By reducing the homogeneity of plants in one area, you also increase the potential for a diversity of insects and thus the likelihood of predators. Thus, there are more insects to feed upon one another as opposed to feeding on the plants. More legumes than ever before have been planted down at the Garland Community Garden this year. We have done this primarily as a technique to improve the soil in our beds as we plan to turn the plants under as green manure to increase the nitrogen content of the soil as well other organic nutrients. We planted peanuts as a cover crop beneath our tomatoes, and okra. We also planted peanuts as a cover crop on a small hugelkultur we installed in August of 2015. Note: Yes, peanuts grow well in a sandy, slightly acidic loose soil and not so well in the heavy alkaline clay soil of our area here in North Texas. 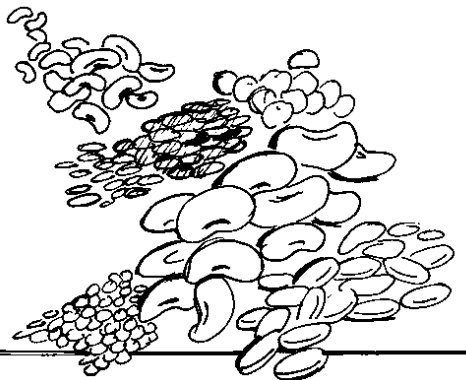 However, if you amend the soil with expanded shale, you can grow not only peanuts, but just about anything in our soil. A couple of days ago I pulled up a couple of peanut plants from the hugelkultur bed. Low and behold! We have peanuts! Soon we will be harvesting them all over the garden. Last year the green bean crop we planted down at the garden consisted mostly of bush variety beans. Down at the garden this year we planted pole beans exclusively and have been very happy with the results. Bush beans grow on a bush while pole beans grow on climbing vines. 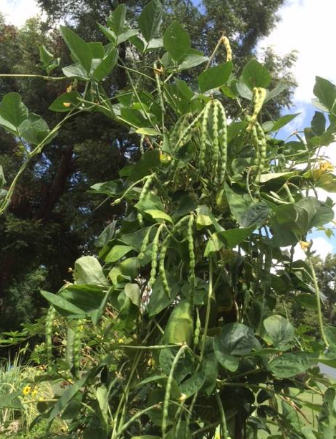 Pole beans have several advantages over the bush varieties: they will continue to produce beans for several months whereas the bush varieties are good for only two crops and then they are done. Since pole beans can grow vertically, they are ideal for tight urban spaces. You don’t need to go out and purchase an expensive trellis. Simply tie three bamboo poles together in a teepee fashion. 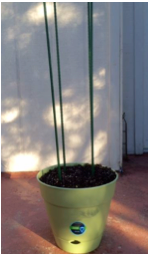 Arrange the poles around the perimeter of a five-gallon bucket and watch your beans grow. This gardening format is beautiful to look at and the beans are easy to pick—much easier that stooping down to get them from bushes that are only about 20 inches tall. Just writing this article has inspired me. I’m sending a note to Jennifer Clements, a second grade teacher at Watson Tech here in Garland to see if she would like for Loving Garland Green to come help her students create three or four pole bean buckets this fall. We can have them outside until the weather turns cold. Then we can bring them inside their lovely greenhouse. The kiddos can have green beans for Thanksgiving and Christmas and they can learn how little space it actually takes to grow some food. This year we received some pigeon pea plants from Susan Metz. 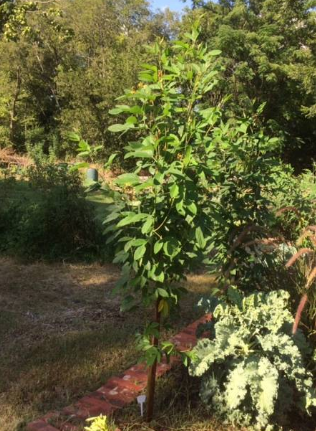 We planted them in our Multicultural garden area and they have grown to over 7 feet tall. Susan has worked as a Senior Research Associate for the Texas Agricultural Experiment Station. Today I believe she works as a consultant to the City of Garland Parks and Recreation Department. 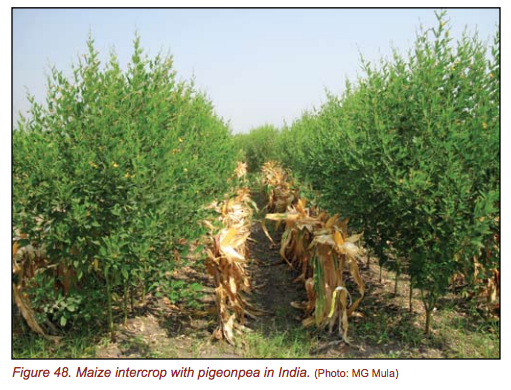 Texas AgriLife Research has been undertaking many different studies involving the potential offered by the Pigeon pea. Susan was involved in a research and education project titled “Pigeon pea: a multipurpose, drought resistant forage, grain and vegetable crop for sustainable southern farms” under the direction of Dr. John Sloan (Associate Professor from Texas AgriLife Research). Search under “Pigeon Pea and Texas AgriLife” to get a list of all their related studies. The pigeon pea makes a lovely shrub. You can see it down at the Garland Community Garden from now until our first frost. Susan tells me they die back. I don’t know if it will return in the spring or if we will need to plant again. I’ll let you know by the end of March 2017. I was talking with someone down at the garden last week. They told me they always planted morning glory vines for their back fence, but after seeing our loofah vines down at the garden for two years they are going to replace morning glory vines with loofah vines next year. Why not! You get even larger more beautiful blooms with the loofah. The plant blooms all day long from June through mid November. 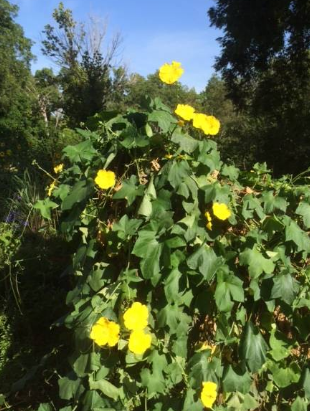 Unlike morning glory blossoms, you can eat loofah blossoms. You can also, of course, eat the loofah vegetable when it is small. And you can harvest the loofah for bath sponges when it is mature. Indeed the loofah is a very easy-to-grow and giving plant. 8AM TO 4PM - As usual: Lots of great stuff. You are sure to find at least one item that you can’t live without. For example, we have over 25 Barbie dolls for sale, along with their various costumes. In addition to the Barbies we have household items, furniture and a ton of winter clothes! Sale is to be held in the yard of members Gene and Margie Rodgers at 211 East Kingsbridge Drive – Garland - 75040 (Cross street Naaman School Road) If you have items to donate, please call or text me at 972-571-4497. Thank you. 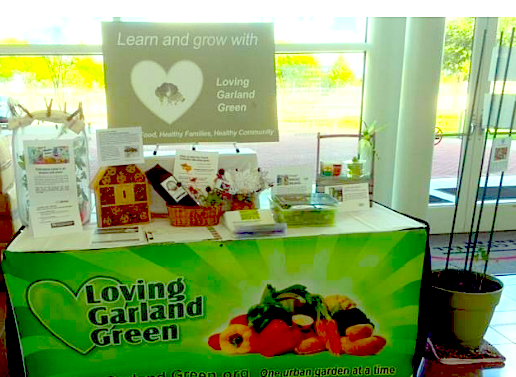 We support the Garland Live Well--Go Green Expo at the Curtis Culwell Center – 4999 Naaman Forest Blvd—9AM to 1PM. We hope you’ll attend this event too. Monday - September 26 – Come learn why fall is the best season to garden. You can come have fun with us in planting perhaps the tallest hugelkultur in Garland. Over the month of September we will be adding soil and compost to a brush heap of logs and twigs that has been growing for about two years. At the event we will pass out information on building hugelkulturs (a water-efficient way to garden). The mound will be seeded with milkweed and other Texas native wildflower seeds. This will become our “Texas Wildflower Hill. We hope you will return in the spring to admire your work. This past weekend I followed my own advice and visited Chris Jacobsen’s Jujube Etc. Farm. As I mentioned in a previous article, you can visit Mr. Jacobsen’s farm during September weekends: 10 to 5 on Saturdays and 2 to 6 on Sundays. His 35-year old jujube orchard covers about five acres and contains 300 jujube trees. The exact location of his 15-acre farm is 7904 County Road 572 in Farmersville, Texas 75442. Chris, a remarkable man, manages this farm all by himself. If you wish to visit other than on a Saturday and Sunday in September, please call him at 972-784-6480. Chris began his long life in Denmark. Like his father before him, Chris was educated as a horticulturist. His father built one of the largest greenhouses in the southern area of Denmark. It survived World War II—the teenage years of young Chris. In the early ‘50’s when he was 26, Chris spent a year traveling all around the world—from the USA to Australia. He ended up settling in the USA and going to work as a salesman for Stark Brothers Nurseries and Orchard Company. [Founded in 1816, Stark Brothers is one of the oldest nurseries in the USA.] As it turned out Chris was assigned a sales territory in Texas. I believe he settled in the Irving area and then in 1974 he bought his present homestead in the Farmersville area and settled there. Since that time he has been very busy growing his beautiful jujube orchard. The orchard is beautiful. Its symmetry is a testimony to the professionalism of Chris Jacobsen who has planted, grafted, and tended each of these 300 trees for over 35 years. 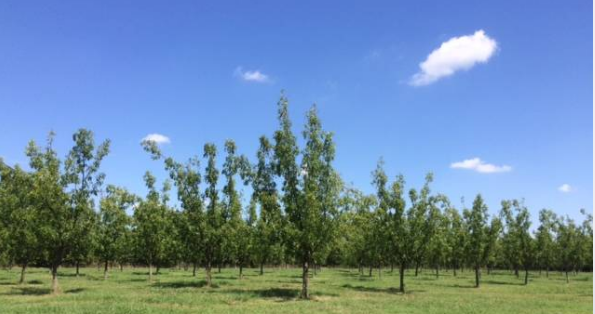 A few of the 300 trees in Chris Jacobsen’s Jujube Orchard – September 3, 2016. Begun over 35 years ago, neither chemical sprays nor chemical fertilizers have been used in this orchard. As far as we know, this is the only commercial jujube orchard in the USA. Will Chris Jacobsen’s Work Carry on? I certainly hope so. Its fate seems to be largely in the hands of a fellow named Bryan Gordon. Bryan met Mr. Jacobsen several months ago through a fellow permaculturist and good friend of Chris Jacobsen. Bryan is a horticulturist, permaculturist, and arborist. Over the last several months, Bryan has built a working relationship with Mr. Jacobsen. He volunteers when he can to assist Mr. Jacobsen in keeping his place in working order. In return Mr. Jacobsen is teaching Bryan how to carry on his dream of sharing jujubes and their healthy benefits with the world. In addition to learning how to graft the trees and take care of them, he is also learning how to make the Jujube products Mr. Jacobsen once sold such as soap, skin care products, capsules and more. Bryan hopes to incorporate a jujube orchard into his future farm plans and keep Chris' legacy going. As far as the future of the farm, Mr. Jacobsen has donated the property to a Christian organization. Bob Landon served up samples of Landon Winery sherry made from Jacobsen Jujubes. Sherry from Jacobsen jujubes is delicious! You can only find it at Landon Winery. 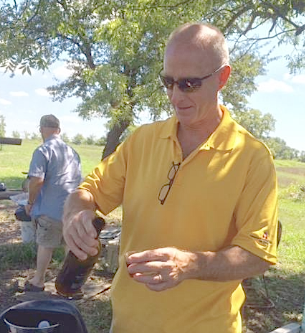 As an added treat on Saturday, Bob Landon of Landon Winery was at the farm on Saturday. Landon Winery has two locations: 101 North Kentucky Street in downtown McKinney and also a downtown location in Greenville, Texas at 2500 Lee Street. Bob was giving out free samples of the sherry from the winery that was made with Jujubes from Mr. Jacobsen’s trees. It was delicious. Charlie bought a bottle for me. It was quite a bargain. I don’t know if Bob will be there again or not but it’s worth the drive out there to see. If he is not there, you can always visit the Landon Winery in McKinney or Greenville. We hope that a local grocery store will soon be featuring this delicious and international award-winning treat. How special! Local sherry produced from a local orchard—possibly the only commercial jujube orchard in the USA. This sherry, a connoisseur’s choice, recently won the Lone Star International gold medal for excellence. 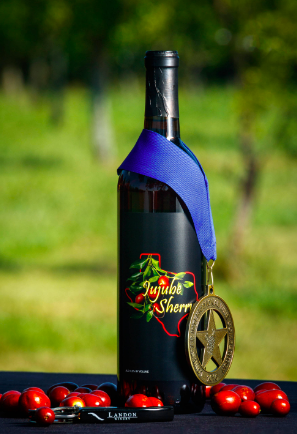 This sherry recently won a gold medal in the Lone Star International Wine Competition. Kari and Jesse Patterson also came to pick jujubes today. Mr. Jacobsen has some loyal followers and jujube fans! 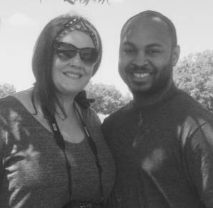 This is Kari and Jesse’s third year to visit the farm. Jesse, a professional photographer, has taken some great photos of Mr. Jacobsen on his tractor and around the orchard. So, what’s all the fuss about jujubes? The Jujube (Ziziphus jujuba) is a remarkable fruit. I would elevate it to the position of a super food such as kale. It can be grown from Pennsylvania to Mexico. It prefers hot and dry climates while it will tolerate temperatures a few degrees below zero. While it’s a good choice for our Garland Community Garden (and we do have a small one growing there); it’s not an outstanding choice for most urban yards—unless you happen to be a dedicated gardener. Potassium is a proven heart strengthener while magnesium works in conjunction with potassium. Jujubes increase the level of the body’s nitric oxide, restoring and dilating the blood vessels for better blood circulation. And there is so much more to know regarding the healthy benefits of the jujube. Just Google jujube and look at all the information that appears—from medical articles, to health products, to recipes. I simply steep a bunch of jujubes in boiling hot water, strain off most of the pulp and drink the delicious and healthy tea. The leaves of the jujube also can be used to make tea as well. 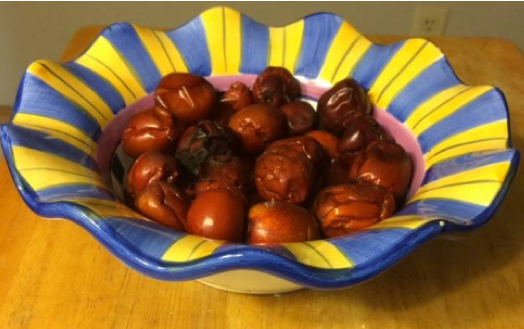 If you want to see a real jujube, attend the next Loving Garland Green Meeting: September 5 -6:30 to 7:30PM – 216 EAST Kingsbridge Drive – Garland Texas 75040 – near the cross street of Naaman School Road. We will have some available for tasting. If you want to grow one yourself, there are nurseries all over the USA that sell them. Get online and locate the one nearest to you. COMING SOON: The King of the Jujubes! 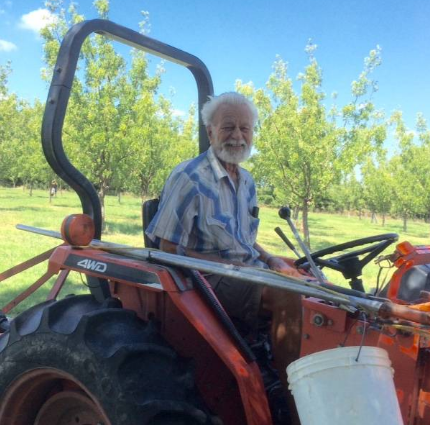 Chris Jacobsen on his tractor: A 90 year-old Danish immigrant, educated horticulturist who still single handedly takes care of his five acre, 300 jujube tree orchard near Farmersville. I took my own advice and drove out to 7904 County Road 572 Farmersville yesterday. It was well worth the trip. For the month of September, Mr. Jacobsen's farm is open on Saturdays 10am to 5pm and on Sundays from 2pm to 6pm. You can pick a pound of jujubes for $3--a great family adventure. The orchard is beautiful--a work of art. On Monday after I get edits to my article on Mr. Jacobsen and some of his friends I'll post it here. His is an interesting story. But you don't have to wait until tomorrow, you can visit his farm this afternoon. It's a 44 minute trip in the country from Garland--well worth it. If You Want Organic: Buy Local or Grow it Yourself! Plant Diversity in action at the Garland Community Garden: Visit our Multicultural plot and the one next to it for examples of thriving plant diversity in action. Traditional industrial agriculture promotes acres and acres of mono-crops, which in turn often require heavy doses of pesticides and industrial equipment to maintain and harvest. Organic farming, by contrast, promotes plant diversity, which in turn sets up a natural ecosystem to protect plants from predators. Sorry folks, but the title of this article is close to the absolute truth. “Buy local” means purchase the food you eat from growers you know, from farms or gardens that you can visit in person. Our Current Food System Is Not Sustainable. America is losing up to 40% of its food from farm to fork to landfill. “Getting food from the farm to our fork eats up 10 percent of the total U.S. energy budget, uses 50 percent of U.S. land, and swallows 80 percent of all freshwater consumed in the United States. Yet, 40 percent of food in the United States today goes uneaten. This not only means that Americans are throwing out the equivalent of $165 billion each year, but also that the uneaten food ends up rotting in landfills as the single largest component of U.S. municipal solid waste where it accounts for a large portion of U.S. methane emissions. To begin with, you are likely never to purchase many products that are “organic” in any chain store and that includes stores that promote themselves as healthy food stores. Organic does not merely refer to how produce is grown, it also refers to how the produce is distributed, packaged and marketed. Just for starters, “Organic” means the produce is brought to the store from nearby—not shipped from hundreds or thousands of miles away thus depleting un-renewable resources such as fossil fuels. “Organic” has largely gone mainstream for the sake of Wall Street. Investor profitability. For example, Cascadian Farm is now owned by General Mills. Cascadian is located in the town of Rockport, Washington-- 75 miles northeast of Seattle. Gene Kahn started the farm in 1971. Kahn is now a General Mills Vice President and a millionaire. Horizon is a $127 million public corporation that that controls 70 percent of the retail market for organic milk. Their milk is now "ultra-pasteurized," a process that pushes the freshness date into the next millennium. It is also a high-heat process that destroys enzymes and many of the vitamins in milk. 1. Grow some of the food you eat. Even if you have limited space, a family of four could grow enough kale in four five-gallon buckets to supply their family with this super food, vitamin-packed green year-round. Kale is easy to grow and easy to harvest. It is a plant that keeps giving—even during the winter. 2. Stop purchasing cereals—you know, the kind that kids love. Don’t even go down the cereal aisle any more. These cereals are laced with sugar and pesticide residues. Next to breakfast tarts, they are among the worst choices for a child’s breakfast. In fact, just about everything you see in the cereal aisle of any grocery store is not fit to be labeled as food. Pesticide residues are omnipresent in the American food supply. The FDA finds them in 30 to 40% of the food it samples. The government has established “acceptable” levels for these residues in crops. Whether “acceptable” means they're safe to consume is debatable. 3. 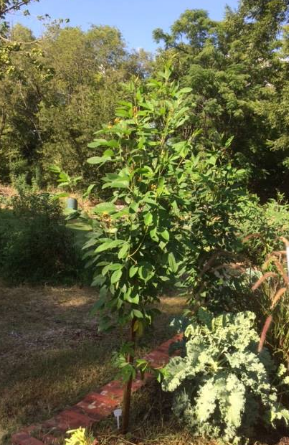 If you have a yard, plant a tree that will bear fruit your family can eat—even if this means digging up that useless Bradford Pear tree that so many in our DFW area seem to love. A fruit tree requires little effort to maintain. You don’t have to go all out and become Mr. McGregor the gardener. Another excellent choice for a fruit-producing plant in our area is the thornless blackberry. Four blackberry plants in my yard faithfully produce 75 pounds of blackberries every year for the past three years. Except for trimming back once a year, they require very little care. 4. Find out where organic farms are located in your area and visit them. You can learn a lot by visiting these farms and talking with the people who own and operate them. 5. Visit your local community garden: observe, learn and apply. Most communities in the DFW area have such gardens. The Garland Community Garden is located on 4055 Naaman School at the corner of Brand and Naaman School Road. Located about one hour north of Dallas in eastern Collin County. Like most small organically run farms, Truth Hill Farm has a delivery system that allows your to place an order online and then pick it up at one of their designated drop centers. Please call or email to set up a time to visit. A family farm serving the Dallas and North Texas areas since 1984. Located 45 minutes Northeast of McKinney, Good Earth Organic Farm has been maintained organically for over 30 years. They sell from their farm's store and at local farmer's markets. Please call or email to set up a day and time to visit. VISIT EVERY WEEKEND IN SEPTEMBER AND HARVEST YOUR OWN JUJUBES FOR $3 A POUND! Bring your own bags and gloves. Jujubes have thorns! The first weekend will be Labor Day weekend, and each September weekend after that. Saturdays we will be here from 10 AM to 5 PM and Sundays after church from 2 to 6 PM. Jujubes are delicious fruits that are easy to freeze, and dry in the dehydrator. Very medicinal, contains 18 amino acids, and betulinic acid. Vitamins C & A, B1, B2, B3, B6 + minerals. Leaves are free and used for tea. Also the Garland Community Garden has a jujube tree that is planted near the front of our garden. This is its first year so won't bear fruit. In addition I think I’ve published information on the jujubes previously on this blog. Our Blackland Prairie Soil must be amended if you hope to successfully grow most vegetables. Simply put this means tilling the soil 8 inches down and mixing with expanded shale. This is a one-time event for preparing the soil. After that no more tilling. Just continue to nourish with compost. You will find the recommended ratios of expanded shale per square foot of soil on the bags of expanded shale.